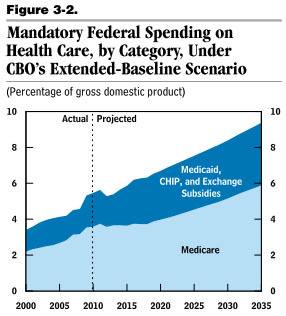 Domestic discretionary spending and miscellaneous mandatory spending (“Other”) is on a steady downward slope. Interest spending is on a downward slope. Defense spending has gone up over the past decade due to the wars in Iraq and Afghanistan, but otherwise is on a steady downward slope. Social Security is pretty flat. I cut this chart off at 2008 so that the long-term trends are easier to see. There’s been a spike in these numbers over the past three years because the recession has temporarily depressed GDP and temporarily increased spending — just as there were spikes during the recessions of 1979, 1989, and 2001 — but that spike will go away when the economy improves. There’s no special reason that it should affect our view of our long-term finances. 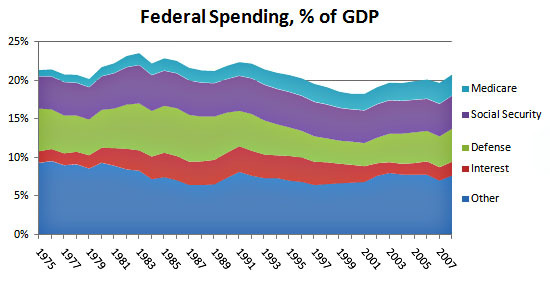 So: should we be especially worried about discretionary spending, defense spending, or interest expenses? No. They haven’t gone up over the past 30+ years and there’s no special reason to think that trend will change. As always, we should pay attention to which programs we need and how to make them more efficient, but these parts of the budget just aren’t long-term problems. very small tax increases and very small benefit cuts over the next two decades, and that’s it. No surprises. This leaves Medicare. And that we should be worried about. It’s gone steadily up over the past three decades and every forecast suggests it will keep going up indefinitely. Ditto for every other kind of healthcare spending, both federal and private. Bottom line: our current deficit panic is mostly just manufactured hysteria. Our recent spike in spending is an artifact of the recession and will go away in the next few years. Generally speaking, defense, discretionary, and interest expenses aren’t an issue and don’t really need any special attention. Social Security is basically fine and needs only a few small tweaks. The only thing we should be seriously concerned about is healthcare spending. Period. That’s the whole story. Anything else is just partisan showmanship. Those are the facts. Pass ’em along.